This report is an update to an earlier attempt to summit Mt. Hood back on July 2nd, 2012. My first attempt to summit Mt. 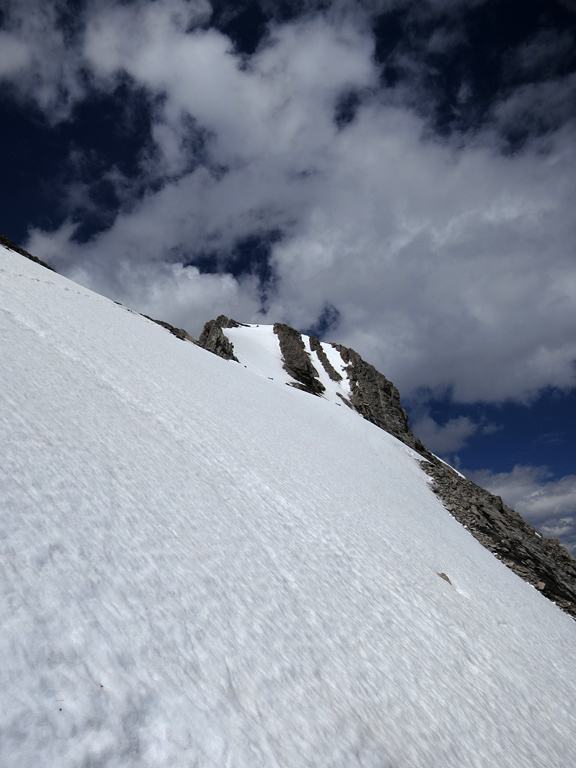 Hood in July came to an end when I ran into a dangerously unstable snow slope on the mountain's east face, a mere 70m from the top. Having thoroughly enjoyed my time in the area, despite this setback, I vowed to make a return later in the season when the snow conditions on that slope should have improved, or even better, melted away completely. As this particular report is intended as an addendum to my original ascent, please consult my previous report for key information on the trailhead location, route information for Mt. Hood and King Creek Ridge (including detailed directions for the traverse between the two), and other useful details. I'll only be elaborating on a few points here, particularly on following King Creek as the approach route from the day use area. The King Creek approach route to Mt. Hood is easier and faster than via King Creek Ridge; however, for it to be viable, the water levels along the creek must be low. Dozens of crossings are required and, once past the junction where King Creek splits to drain the Opal Range peaks to the north and south, the best route is often straight up the creek bed. If you can't easily rock-hop the first few crossing, you can expect a long and very wet approach; and should probably bail for the King Creek Ridge route instead. Thankfully, on this particular day, the water levels along King Creek were quite low. Starting from the day use area, I followed a well-defined (and sometimes bridged) path through a lovely canyon area until I reached the junction (mentioned above) where the creek branches to drain the valley in both directions. You may be tempted to follow a pair of better-defined trails that head upwards to the climber's right from the creek shortly after this junction; however, these are approach trails for Mt. Brock and Mt. Blane. 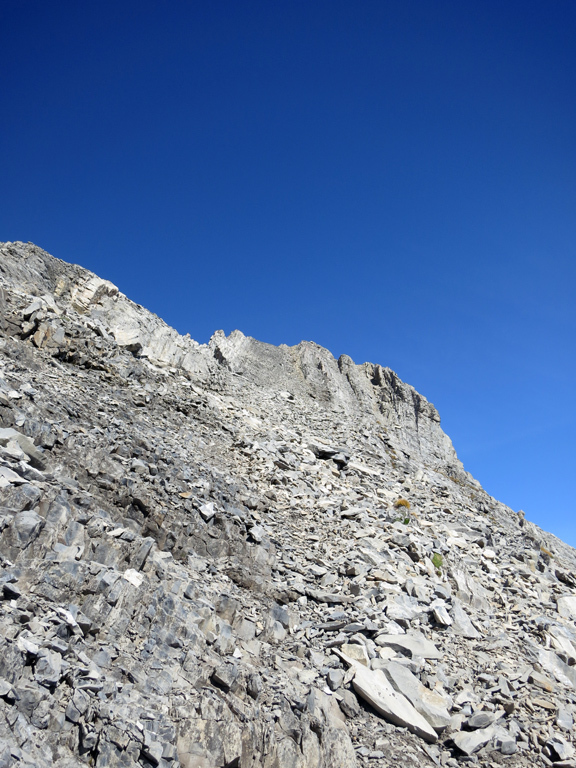 Following either of those trails up could lead to an awkward, difficult, and perhaps impassable traverse over to Mt. Hood. From the junction onwards, the trail along the northern branch of King Creek becomes highly intermittent and difficult to follow. 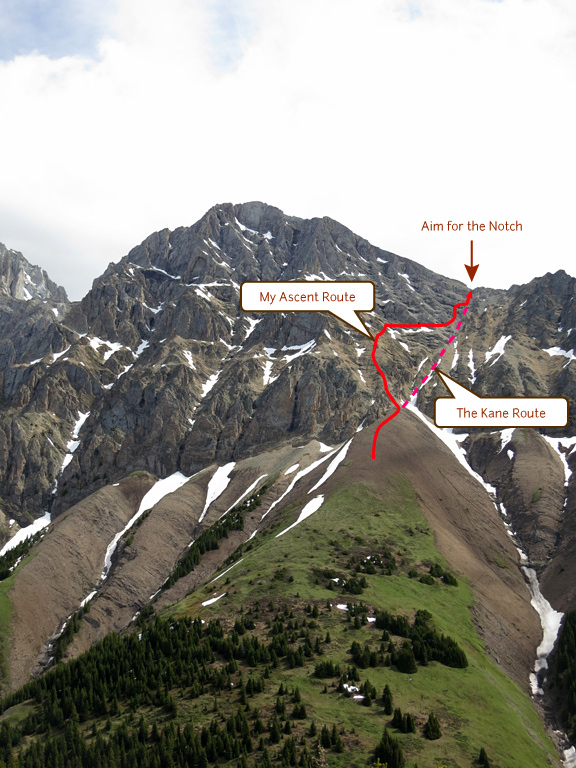 The key is to stay close to the creek, and continue heading north until you reach the headwall/saddle that lies between the northern tip of King Creek Ridge and Mt. Hood. When a trail on the right side would seem to come to an end, I would begin searching on the left side of the creek and would often a new trail to follow there for a while (and vice-versa). The arbitrariness of the trail through this section didn't make sense to me, and I often gave up on the route-finding and simply followed the creek bed, which was thankfully dry at this time. There are also sections of the trail that, due to low traffic, are hidden by knee-high vegetation. Remember, the advantage of this route is that it's less distance and substantially less elevation gain (and then loss) than following the nearby ridge, and not that it's fun. Things mercifully come to an end once you near the headwall, where the creek curves to a large, sloping waterfall on the right that points directly at Mt. Hood. Ascending to the left of this waterfall here (and the gully above it) will lead you directly to the ascent route on the mountain. A faint trail had formed in this area since I had made my attempt back in July. As with my first ascent, I chose to take an alternative (and often cairned) route that bypasses the majority of the Kane one and which got me to the col quickly, and relatively painlessly. I kept my fingers crossed as I made my way up past the false summit and was incredibly relieved to see what looked like this in July, now looked like this in September. What a difference a few months can make! It was a bit of a scree slog to the top, but I was happy to face that challenge rather than the possibility of an uncontrolled, and potentially fatal slide into Hood's eastern bowl. I spent an hour at the summit having lunch and enjoying the excellent views. Despite some haze, I could make out downtown Calgary from nearly 80km away! After filling out the registry, I began retracing my steps down to the col and then followed the Kane route down (a gully which had been full of snow back in July, but was dry now). This is definitely the better descent route if you're soloing, but can easily become a rockfall shooting gallery if there are other people around. I chose to hike out via the very scenic King Creek Ridge to properly finish off the day, and my second amazing trip through the area this summer. I can't recommend this one enough! But be sure to save it for a good weather day during a late season dry spell. 2,903 m / 9,524 ft.
1,688 m / 5,538 ft.
1,215 m / 3,986 ft.
145 m / 476 ft.